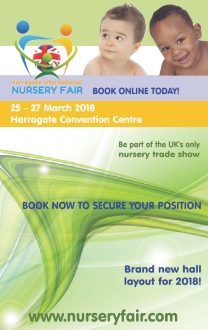 The Baby Products Association has just concluded the busiest month of its year hosting UK Pavilions at two significant international shows – ABC Kids Expo in Las Vegas and Kind und Jugend in Cologne. This is the second year that members joined forces at the USA show and whilst the clash of dates with Kind und Jugend affected the number of attendees, all of the participants reported a hugely successful event. 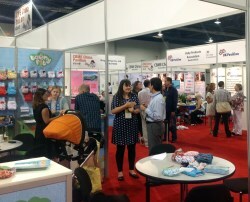 ABC Kids Expo places exhibitors before a very different buying audience to European shows, with a significant visitor presence from not only North American regions but diverse areas of South America and Canada too. Simon Anslow, UK Pavilion co-ordinator at the show, commented: “All participants reported excellent results and some stands were incredibly busy for the entire duration gaining a large number of orders, distributor deals and for one company, a potentially lucrative licensing agreement too. Now in its sixth year, the UK Pavilion at Kind und Jugend was the biggest ever covering a staggering 2,500 square metres with more than 65 exhibitors participating. Early feedback suggests an even busier show than 2013, with an average of 70 potential leads taken by each company. 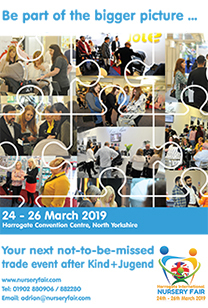 The UK Pavilion coffee and networking arena, sponsored by Emma’s Diary, buzzed with activity as exhibitors met with buyers to discuss business and housed two informative seminars by leading market research company GFK. It also provided the venue for the hugely popular networking event which took place on the first evening of the show.